Note the road to the lighthouse is gated as there has been vandalism in the area. Visitors will have to park off road at the gate and walk in. 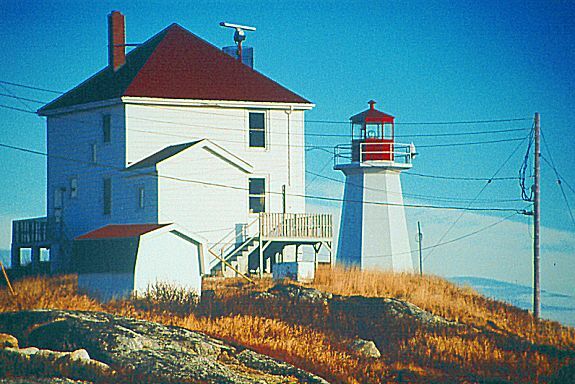 Chebucto Head has had four lighthouses and several keeper's houses. 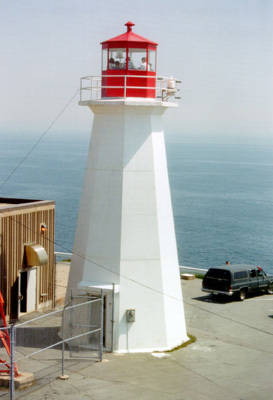 The current lighthouse is a white octagonal concrete tower with a red aluminum lantern, built in 1967. This is the first lighthouse at Chebucto Head, built in 1872, a square wooden tower painted white with a dwelling attached. Below it, on the rocks by the shore, you can see the fog signal building. 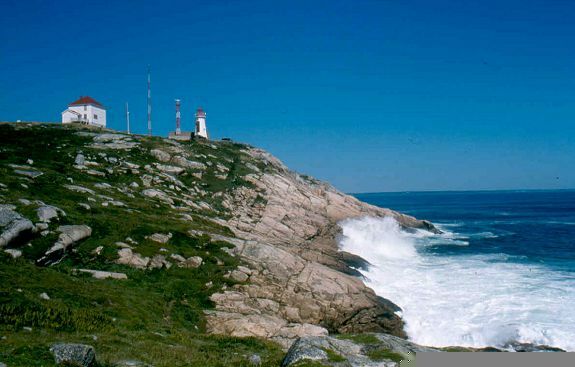 It housed steam foghorn equipment transferred from Sambro Lighthouse. The second lighthouse at Chebucto Head was a concrete tower with a red lantern, built in about 1928. The photograph below, of keeper Edward Gallagher and his family, plus oral history interviews, proved it's existence. The photograph also shows the comfortable keeper's house of that era. The lighthouse was destroyed in about 1940 because the site was needed for a gun gun battery. If you stand at the current lighthouse and look out to sea, you can see a house projecting from the cliff. This house is built on the foundation of an observation post which was part of the battery. 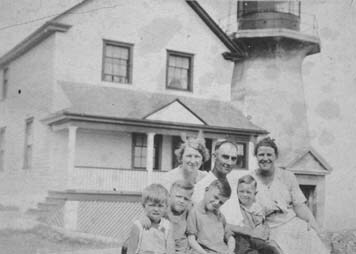 This is Keeper Edward Gallagher and his family in front of the lighthouse. ACKNOWLEDGEMENT: Contributor: Dan Conlin, Kathy Brown, Lise Chapman. This lighthouse style originated in the 1870s and was popular for shorter range coastal lights which did not require a huge lens structure. The medium sized lantern could be accommodated on the dwelling roof and thus combine two structures in one. This is a rare late example of this style as they were most popular at the turn of the century and are seldom seen after the 1930s. It is an interesting example of a traditional design combined with mass produced wartime construction techniques. It looks very much like a two-story wartime house! This is wartime lighthouse had to be constructed when the large Chebucto Head gun battery occupied the site of the 1872 Chebucto Head lighthouse. At this time a lighthouse at the head was needed more than ever before to help guide the enormous number of convoy vessels in and out of Halifax Harbour. As a lighthouse built to safeguard the movement of Battle of the Atlantic Convoys, this building is directly associated with an important national event in Canadian history. Keepers living in this dwelling were involved in pioneering automation programs in the 1970s which saw de-staffed lighthouses such as Maughers Beach and Devils Island controlled remotely from Chebucto Head. This automation eventually spread to all the lighthouses in the Maritime region. This photo shows clearly the two lighthouses after the lantern was removed from the second lighthouse. It was used for storage after a modern bungalow was built for the keeper in the 1960's. Much later, it was turned back into a house and occupied by the Guptill family after the lighthouse was automated. 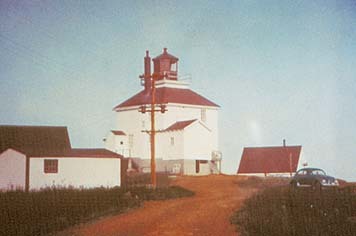 This more recent view shows the current concrete light on the right, and to the left of it the keeper's house/third lighthouse. 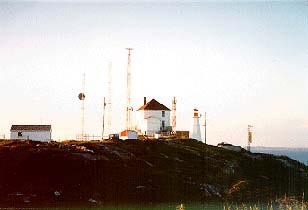 Chebucto Head has been the site of traffic control for Halifax Harbour and this shows the lighthouse when it was surrounded by aerials and communication equipment. Much of this is now gone because the Traffic Control has been moved to Bedford Basin where the controllers view the harbour by radar. It is interesting to listen to them on marine radio inquiring as to fog conditions and the identification of some of the targets that they see. Note communication aerials. At this this time the station was the traffic monitoring center for Halifax Harbour. Sometime during the evening of the 24th or early morning of the 25th of May 2004 the keeper's house burned to the ground. The head was shrouded in dense fog, and the situation was not discovered till later in the day on the 25th when technicians arrived to check out a malfunction at the lighthouse. The keepers house was a total loss. The fire is judged to have been suspicious but those responsible have never been found. The site has been cleaned up and there is now no sign that the house, which was the WW II lighthouse with the lantern removed, ever stood on the knoll to the right of the parking lot. The Chebucto Head Lighthouse Society was planning to start work on restoring the keeper's house on the weekend after the fire. The house is sady missed by residents of Halifax. The lighthouse is a very popular destination for weekend hikers, berry pickers, shipwreck divers and people who drive there for the view of the ocean, storms, passing ships and whales. As such it has a popular landmark status. a) To preserve the Chebucto Head Lighthouse Site, including its historic buildings (lighthouse and keeper's house) for future uses within the local adjacent communities. To collect information on the natural and maritime history of the site, its buildings and surrounding area (including artifacts, photographs, lore and oral histories), making it available to the public. b) To designate restored space in the keeper's house for a small facility, which could be leased as a business, to be operated in concordance with the objects of the society. c) To provide communal space to be utilized for public educational and cultural purposes, especially those relating to the natural, cultural and maritime history of the site and the region. d) To support the protection of the environmentally fragile landscape, the coastal barrens, around the Chebucto Head Site. To pursue any developments of the site under strict mandates of environmental sustainability. This keepers house shown in the foreground was destroyed by fire on May 27th, 2004.The radar shown in the photo was mounted on a tower behind the house. The society gained members from all over Nova Scotia, who felt very strongly that Chebucto Head Lighthouse should be preserved and public access to the site should be maintained. The Society carried out a visitor's survey at Chebucto Head, and arranged a lease with DFO. Unfortunately, just as they were about to begin work to preserve and repair the house it burned to the ground on a very foggy night. The origin of the fire was not determined, but it is regarded as suspicious. 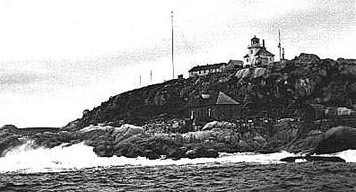 After the fire, the society was unable to raise funds to replace the keeper's house and the lighthouse now stands a very lonely sentinel at the entrance to Halifax Harbour. The property, a sensitive coastal ecologial area, is still owned by DFO. The Society has abandoned plans to rebuild, but is still actively involved in maintaining public access to the Chebucto Head site, and in future would like to install an interpretive plaque. 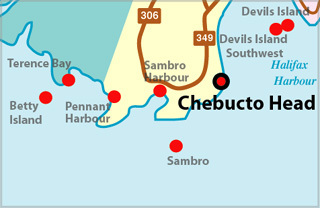 Most of the surrounding Crown land has been designated as a Nature Reserve by the provincial government, and the hope is, that the Chebucto Head site will eventually become a part of this protected area. Negotiations are on-going between DFO and the province. If you are interested in receiving further information about the Chebucto Head Lighthouse Society, please contact NSLPS and your mail will be forwarded. On the head at the west entrance to Halifax Harbour. New tower built c.1940 to replace #2 tower. New tower moved approx 1/2 mile north of original position. Light Height: 162ft feet above water level.